Statement from the Minnesota Local Collective of First of May Anarchist Alliance regarding the Socialist Alternative campaign for City Council in Minneapolis. SA seems poised to make some electoral breakthroughs in Seattle and Minneapolis where they may score over 40% of the vote and conceivably even win seats in city government. This prospect has caused quite a bit of discussion on the Left which is likely to only increase after the election. All across the Central, Corcoran, Phillips, and Powderhorn neighborhoods of Minneapolis you can see the red & white “Ty Moore for City Council” yard signs, symbolic of the impressive effort the campaign is mounting. The Campaign literature emphasizes social justice, in particular the ongoing movement to defend homeowners from foreclosure and eviction. The Green Party (Minneapolis’ 2nd party) and, significantly, the SEIU union leadership have endorsed Ty’s campaign – signaling an apparent challenge to Democratic-Farmer-Labor rule in Minneapolis. What could be wrong with all of this? Plenty, actually. Electoral campaigns, including this one, have as their aim to get “our guy” into a place of power – the government – and to “educate” the public on issues of importance. But what kind of power is this? And what are people being taught? The State overlaps with and is usually subordinate to the economic hierarchy of the super-rich, their corporations and banks – what the Occupy movement called “the 1%” and what anarchists refer to as “the ruling class”. Together, the ruling class and the State control the system of exploitation, oppression, and alienation – and the resultant wars, low pay, police brutality, sexual harassment, gentrification, environmental destruction, boredom and depression – that dominate our lives. Prioritizing a campaign for City Council can be seen as akin to saying that workers should focus their energies around getting the right person to be their CEO or on the board of directors. Historically there have been two ways people have organized to confront this system: Reform or Revolution. Reform is the idea that the system can be successfully modified and improved through legal means and especially through participation in its official channels like lobbying and elections. Reformists argue that this is the realistic and peaceful approach to change. The problem is that the system, while very adept at incorporating and co-opting reform efforts, has been incredibly resistant to any fundamental structural change from within. It is built to administer class division, racism, sexism and homophobia – not to end it. Those that accept the logic of helping run the system are rewarded. Many more reformists have been changed by working within the system than vice versa. The biggest reforms under capitalism have actually been the product of struggle from outside the system, not from friendly politicians within. From the union sit-down strikes, Black Liberation movement, and anti-war resistance, to ACT-UP, and the May 1st immigrant strikes – militant mass movements of people using direct action outside the system have forced governments of the left and right to concede to popular demands. Revolutionaries want to help take these independent movements from just defending past gains or making limited demands on to the offensive by challenging all of the authoritarian social relationships and the system that administers and defends them. This will require a social revolution that expropriates the rich, dissolves the State apparatus, overthrows structural and cultural patriarchy (sexism) and white supremacy (racism) and builds decentralized, directly democratic, ecological self-governance from below. Campaigns for City Council are a detour from our tasks. But isn’t Ty’s campaign at least raising issues? Won’t his campaign teach people about Socialism? First, movements across the city were already raising the issues of low-paid service work, the foreclosure crisis, and immigrant rights. We don’t need a politician to legitimate those movements. More troubling is the inference that this campaign is taking these demands to a higher level. It will not be City Council resolutions that prevent foreclosures or raise minimum wages, but a mobilized community willing to physically block sheriff’s evictions, and organized workers willing to strike. 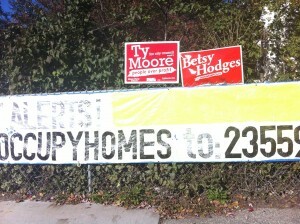 Second, Ty Moore’s campaign isn’t saying much about Socialism (however understood). The campaign does not mention capitalism, socialism, workers control, or revolution. This is an important choice. Ty Moore is campaigning for reforms of capitalism not its abolition. But campaigns teach by more than what is in their written programs. Even if the campaign was more explicitly radical, functionally it is teaching people that social change comes about through electing better politicians. The campaign has all the features of a mainstream election effort – adoration of a single personality, exaggeration of his “leadership”, meaningless pledges to “get results for you”. This is an elitist approach that reinforces the passivity of people by making someone else the “leader” who gets things done, instead of arguing for all of us to take control over our own lives. The activists and community members who have dived into the Ty Moore campaign are not prioritizing organizing one-on-ones to plan direct actions at work, at school, or in their neighborhoods, or discussing and debating how to replace the racist police with community militias or how narrow gender-roles stifle our humanity or how to build rank & file power against the union bureaucracy. They are rallying around “our guy” and training people to fundraise and to get out the vote. This is the main lesson that participants in the campaign are gaining: How to participate in this unjust system. Socialist Alternative has organized an impressive united front around its candidate. The campaign describes it as a breakthrough: “A big-tent coalition is emerging as an alternative anti-corporate base of political power in Minneapolis, uniting union leaders with socialists, Greens with disillusioned Democrats, block club leaders with urban farmers, immigrant rights advocates with LGBTQ organizers, and Somali business owners with Occupy Homes”. What we notice is that at the core of this coalition are organizations influenced and funded by SEIU leadership, and sharing their top-down, staff driven, reformism with a militant veneer. It seems that SEIU leadership recognizes in Ty’s campaign a similar approach and made the calculation that a break with the DFL here would help solidify the hegemony of this kind of politics over community, labor and social activists in Minneapolis. It is not just that reformism is inadequate for fighting capitalism and the State, but that in order to maintain its place within the system the reformists have to be able to police the radicals and grassroots. Nationally SEIU has played hardball with its internal dissidents (such as placing militant locals under trusteeship) and Occupy Homes pushed out its solid anarchist activists. A major leader of Socialist Alternative’s sister organization in Britain threatened to “name names” of the hundreds of militants who fought the police during the Poll-Tax riot against Margaret Thatcher’s policies. We should not automatically assume that a Socialist on the city council would be an ally of radical social movements. The Ty Moore campaign has succeeded in making a splash, and whether he wins or loses, by challenging the DFL, the campaign may have opened up some space for alternative politics in Minneapolis. These potential positives are undermined by the nature of the project: a radical reformist campaign to enter the government. All of our experience tells us it will lose its radicalism and will gain no significant reforms. While we certainly also oppose Ty’s main opponent Alondra Cano (the DFL candidate supported by the City establishment as well as some activists), and are not trying to sabotage Socialist Alternative’s efforts, we cannot support any politician including Ty Moore’s campaign. We are enthusiastic about the growing possibilities for radical change and the increasingly complex web of organizations and people out there struggling and experimenting with different approaches – but it is crucial that movements also find ways of reflecting and evaluating our experiences and history. We understand that some friends and allies will look at the situation differently. Discussion and debate is good for the movement. We see this is a contribution toward that ongoing conversation, and look forward to fighting alongside each other wherever possible. We will continue to put our efforts into building radical autonomous movements of workers, students, prisoners, and the poor. Our goal is revolution not just reforms. Our strength is in the neighborhoods, workplaces, and schools – not the voting booth. Power to the People, Not Politicians! I saw this ended up News as well as the library. I think probably the library is the best place for it. Although it really good, timely piece - especially point IV.